REMEMBERING THE FALLEN TEEN IDOL | Why Does It Exist? When used properly, canned cheese can be an effective weapon. 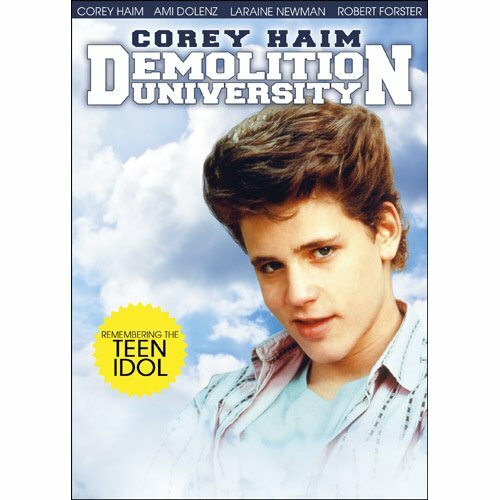 Demolition University is the sneakiest kind of Why Does It Exist? movie: a covert sequel to a movie that would itself qualify for the show, wrapped in enigmatic, shape-shifting poster art that never quite gives an accurate picture of what lies beneath. 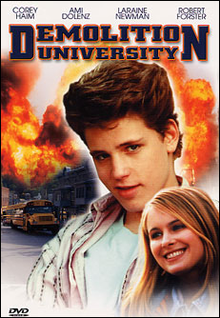 Yet another half-assed would-be franchise starring a Corey, Demolition University is not about demolition or university, but rather about plucky football player slash dork Corey Haim as he foils an attempted terrorist attempt on a water plant. Laraine Newman is the harried teacher caught in the middle of it all while Robert Forster (not yet benefitting from the push of Jackie Brown, it seems) surveys the situation world-wearily. The original, ”hard-edged” cover art. The improved, ”reverent” cover art. Music this week provided by Alligator Baby. The song Calling Confidence can be found on their new album, The Cool Side of the Pillow. They will be launching the album on July 6th at O Patro Vys in Montreal – check out their Bandcamp page for more Canadian tour dates.